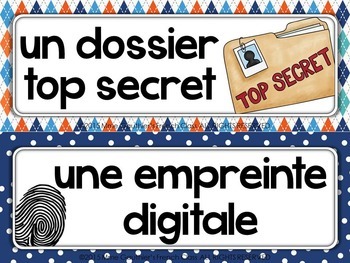 These word wall cards will brighten up your classroom in an instant! 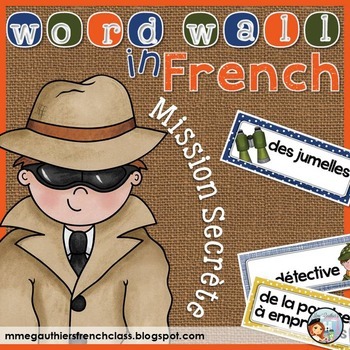 The set includes 22 colorful detective-themed word wall cards for the teaching & learning of 'Mission Secrète' vocabulary. 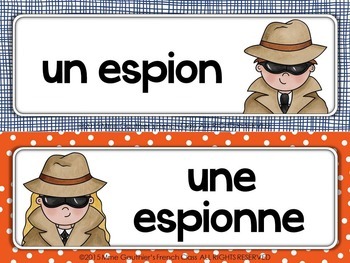 Use them to introduce vocabulary, make a word wall or for fun games & activities in your classroom. These cards are also perfect for your literacy centers & will inspire your students' creativity during story-building activities. I have included coordinated blank cards for you to add more words if you need to. Thank you for looking at my product! Click on Follow Me for product updates! Feel free to use the 'Product Q&A' tab below should you have any questions regarding this resource or if you would like to make a product request. If you purchase this product, simply leave feedback to accumulate TpT Credits which can be redeemed on any product from any TpT store! 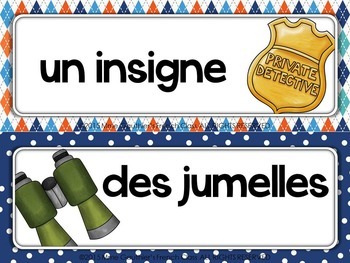 FRENCH WEATHER BUNDLE - QUEL TEMPS FAIT-IL?